Friedman Fine Art offers unique high quality historical and contemporary photos of Chicago, including a selection of black and white photos of famous buildings in the city. The Carson, Pirie, Scott and Company building, now known as the Sullivan Center, is located on the southeast corner of State and Madison streets in the Loop at 1 State St. 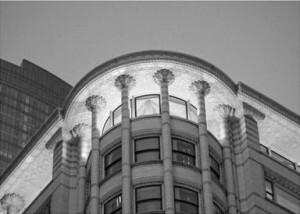 It was designed by Louis Sullivan for the retail firm Schlesinger & Mayer in 1899. The building was built in two phases. First, Sullivan designed a nine-story building, and the second building took over the first, which was built in 1903 reaching 12 stories high. Burnham and Root were hired to help complete the additions. Notable for its elaborate ironwork ornament on the first and second floor and its steel framework, Carson Pirie Scott building is a National Historic Landmark. Bronze and terra cotta also set the building apart from others. In 2006, Bon-Ton Stores Inc. of Carson Pirie Scott announced the department store in the building would close. Carson’s closed in February 2007 and was renamed the Sullivan Center, currently owned by Joseph Freed and Associates LLC. The 600,000-square-foot building is the home of office, restaurant, and school users. Tenants of the Sullivan Center include the School of the Art Institute of Chicago and Target, which opened in 2012. To view more Historical Buildings of Chicago Photos.